Soon Christmas will be here! We're decking the halls, making our gift lists, and preparing for this most wonderful time of year. Bring the spirit of the season to your home with these new designs! Begin with colorful squares inspired by the elegant Art Nouveau style. Classic words are paired with winter and Christmas flowers. Let your creativity bloom and grow with these designs! 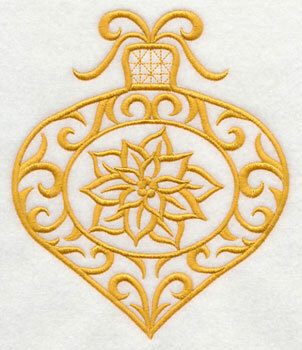 Stitch filigree ornaments onto towels, pillows, and wall hangings. There are in-the-hoop versions too, and they'll add a bright and festive look to your tree. 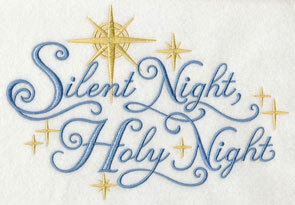 Elegant script with sparkling stars brings the story of the first Christmas to pillows and quilts. 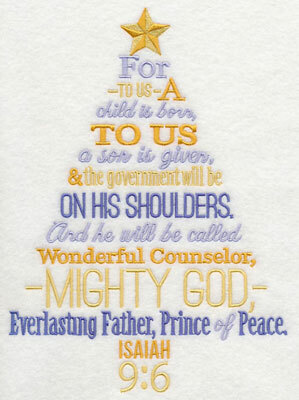 Bible verses in colorful text, and in the shape of trees, are magnificent as framed pieces and cushion covers. 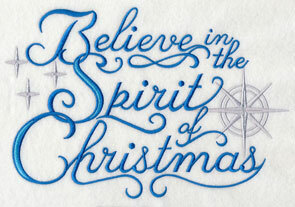 Scroll down the page to see these new designs, and add a very merry spirit to your holiday gifts and decorations! Deck the halls with spirited designs, and bring a lovely look to your home! Click here for instructions for making this banner. These designs are inspired by the classic Art Nouveau style, complete with elegant and graceful lines, and natural elements. 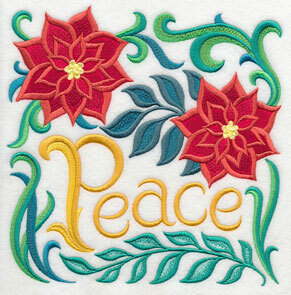 The words 'Peace' and 'Noel' are paired with poinsettias and holly. 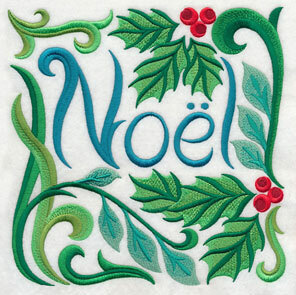 Embroider onto tree skirts, cushion covers, and placemats, to add a festive look to your home decor. 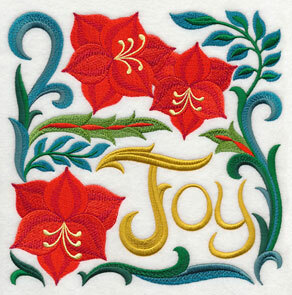 7.70" x 7.78" and 6.90" x 6.98"
5.88" x 5.95" and 4.86" x 4.92"
5.88" x 5.88" and 4.86" x 4.86"
'Joy' is paired with amaryllis in beautiful full blooms. Graceful vines wrap around the square, adding an elegant touch. 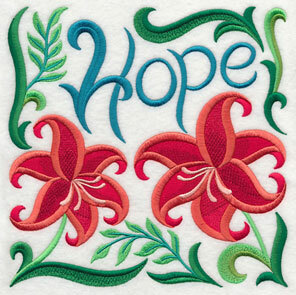 The word 'Hope' is joined by two scarlet lilies, bringing classic Christmas colors to your gifts and home decor. 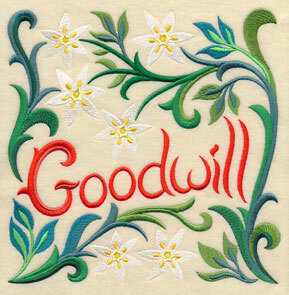 5.87" x 5.86" and 4.88" x 4.86"
7.80" x 7.77" and 6.90" x 6.87"
5.87" x 5.84" and 4.88" x 4.86"
'Goodwill' is paired with cheerful Star of Bethlehem flowers; 'Love' is accompanied by Lenten roses. 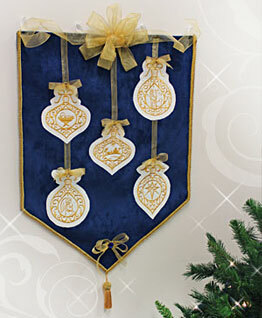 Add to pairs of pillows, or stitch and frame to deck the halls with Christmas spirit! 5.87" x 5.86" and 4.86" x 4.86"
Bring Christmas words and holiday spirit to your home with these designs! The square shape is lovely for pillows, framed pieces, tea towels, placemats, and tree skirts. Order the designs individually by clicking the links above. Or, buy all 6 in a design pack! 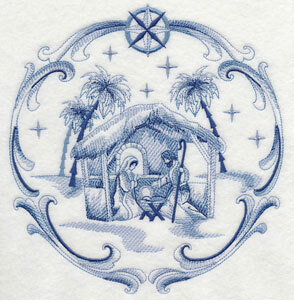 At Christmastime we hear passages from the Bible that foretell and celebrate the birth of Jesus. 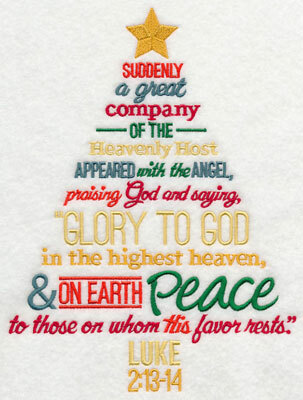 Words from these passages have been arranged in the shape of a Christmas tree, with a bright shining star on top. 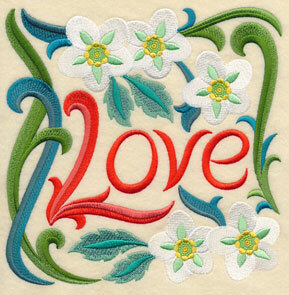 These designs are beautiful on wall hangings and mini-quilts. 6.91" x 9.11" and 5.90" x 7.77"
Make something special for leaders in your faith community! 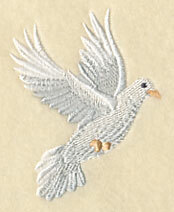 Embroider these designs onto cushion covers, tote bags, and wall hangings. Give as gifts to pastors, priests, choir directors, Sunday School teachers, and Bible study leaders. 6.85" x 9.40" and 5.70" x 7.83"
Medleys and collages bring energy and color to your Christmas decor. 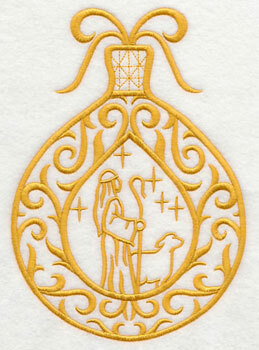 In this design, the Holy Family is in silhouette, framed by an ornate cameo. 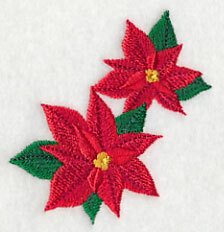 Poinsettias and stars add even more spirit to this design. 7.21" x 6.90" and 6.12" x 5.85" and 5.07" x 4.85"
The cameo and poinsettia are available as single designs as well. Use in conjunction with the above design, or on their own! The poinsettia is a charming accent to linen napkins, and the corners of tea towels. 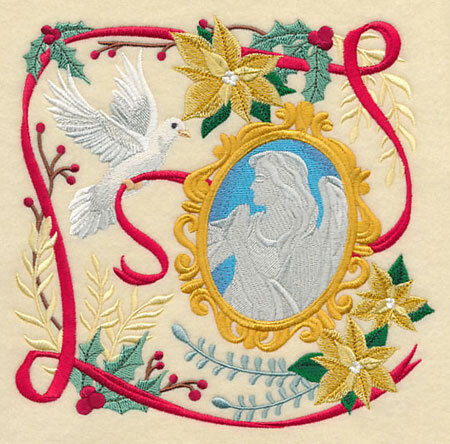 This Christmas medley features an angel silhouette in a cameo, and accompanied by a flying dove, golden poinsettias, and holly. Beautiful on cushion covers and wall hangings! 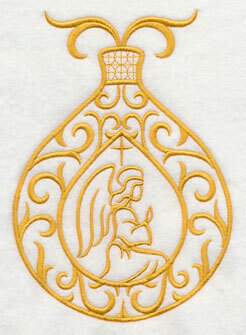 7.10" x 6.91" and 6.04" x 5.88" and 4.99" x 4.86"
The cameo and dove elements from the above are available as separate designs. Use on their own, or in conjunction with the larger design. 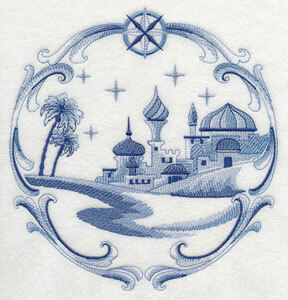 Delft Blue is a classic art style that dates back hundreds of years. It's found on pottery and dishes, as well as fabric. It's recognizable by its beautiful hues of blue, and beloved for its light stitches and open areas. 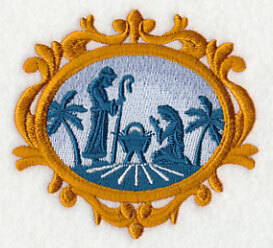 These medallions feature different scenes from the Nativity Story. 7.43" x 7.80" and 6.90" x 7.25"
7.43" x 7.80" and 6.91" x 7.26"
5.88" x 6.17" and 4.86" x 5.10"
Arrange them together for a stunning quilt or wall hanging! Make a series of framed pieces to hang in your home. Tell the story of Christmas with stitches! 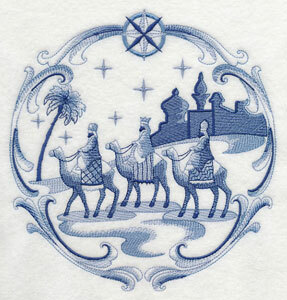 The sleeping town of Bethlehem, and animals from the stable, are perfect pairings to the above designs. 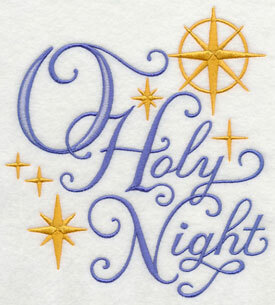 Use them together in a quilt, wall hanging, or series of framed pieces, and bring the spirit of the season to your home! 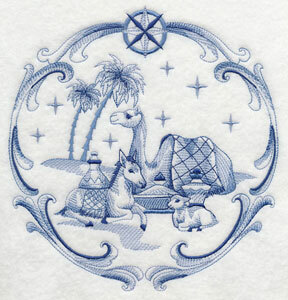 Use the Delft Blue Nativity medallions to make gorgeous quilts, wall hangings, and framed pieces for your home. Elegant script and sparkling stars bring the Christmas message to your gifts and decor. 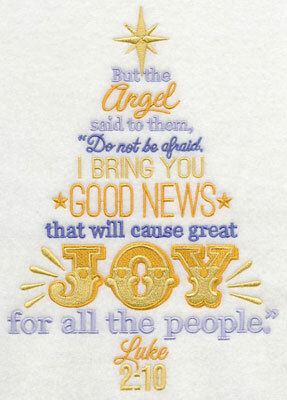 Stitch phrases from Bible verses and classic carols on quilts, tea towels, gifts bags, and more! 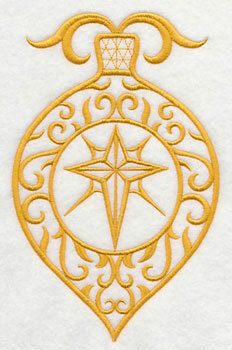 6.92" x 7.60" and 5.87" x 6.45" and 4.86" x 5.34"
These designs have few color changes, making them fast additions to your embroidery projects. 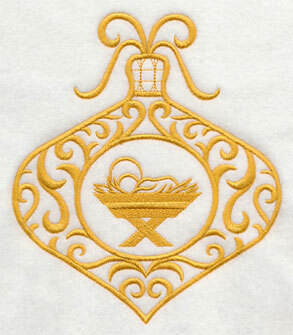 They're a nice shape for cushion covers, aprons, tree skirts, and shirt fronts, too. 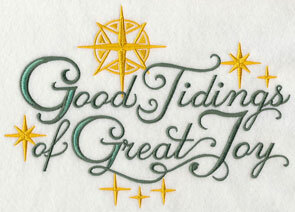 7.81" x 5.30" and 6.86" x 4.65"
Add these spirited sentiments to wall hangings and mantel runners, and bring Christmas spirit to your home! 9.95" x 6.91" and 8.44" x 5.86"
7.82" x 5.43" and 6.86" x 4.77"
Classic and familiar Christmas images are framed by elegant, delicate filigree. 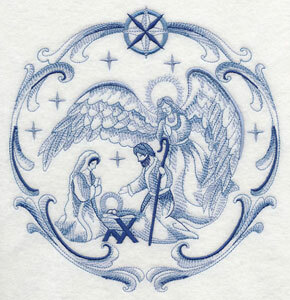 Tucked inside the whirls and swirls you'll find a manger, and a praying angel. 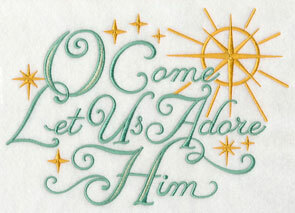 Embroider these one-color designs onto your favorite holiday fabrics - they're gorgeous on velvet and suede! Use the larger sizes for pillows and eye-catching wall hangings; the smallest size is a perfect fit for ornaments to hang on the tree. The star shines bright over the sleeping town of Bethlehem. 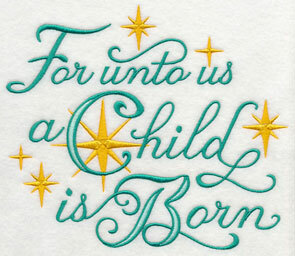 Embroider these designs onto a banner, and deck the halls and walls of your home with the Nativity story in filigree! 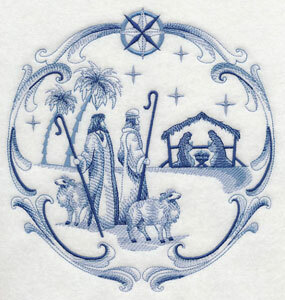 5.87" x 6.44" and 4.87" x 5.34" and 3.53" x 3.86"
A shepherd watches over his flock on Christmas Eve; in the design on the right, a poinsettia is in full bloom. 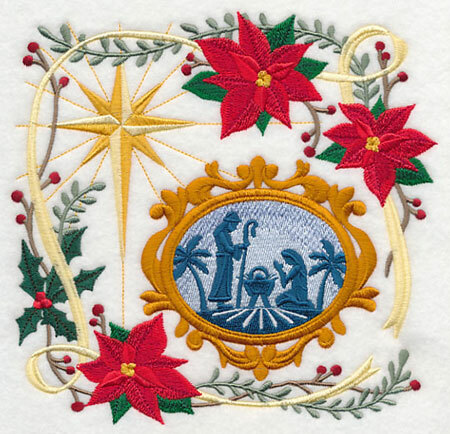 Embroider these designs and add holiday spirit to your gifts and decorations. 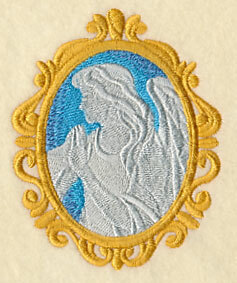 They use one color, so are delightfully quick to stitch. 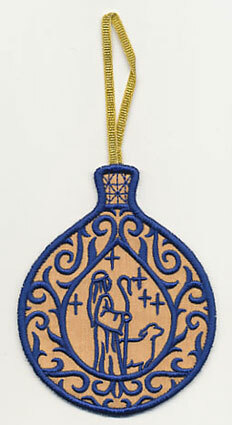 5.87" x 6.90" and 4.85" x 5.70" and 3.29" x 3.86"
The designs above are also available as in-the-hoop ornaments! 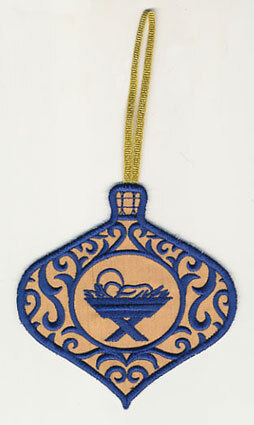 These instructions show how to make the ornaments, right in the hoop. Tuck them inside Christmas cards as extra-special gifts, and hang them on your tree. 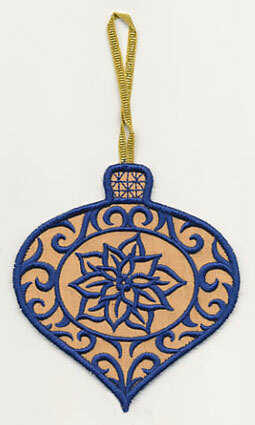 Bring the spirit of the season to your decor with these festive ornaments, made right in the hoop. 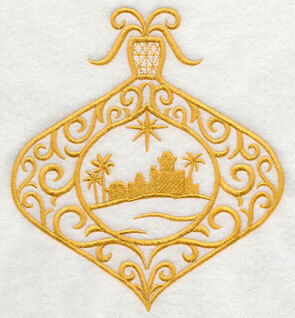 The Eastern Star and the city of Bethlehem designs let you tell the story of Christmas in the decorations that you add to your tree! 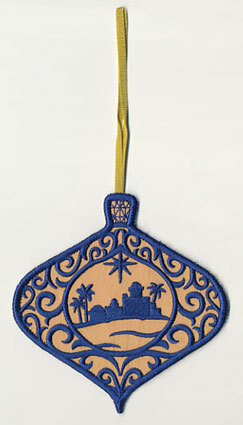 The ornaments are made right in the hoop, and use one color thread. 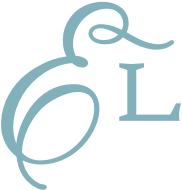 They make beautiful gifts for family and friends - and make a set for your pastor or minister, too! For many of us in the northern hemisphere, Christmas is a time of frosty, winter fun. 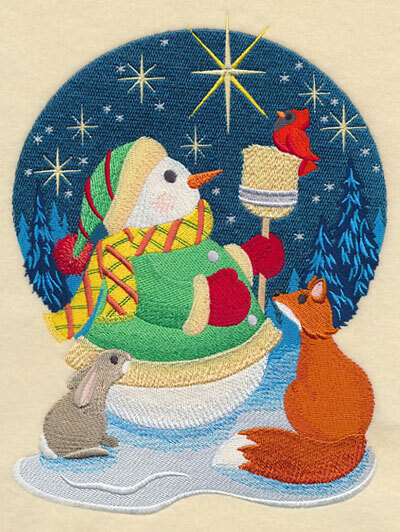 This snowman gathers with his woodland friends on Christmas Eve, and gazes at the starry sky. The night sky circles behind him, bring a snowglobe effect to the design. 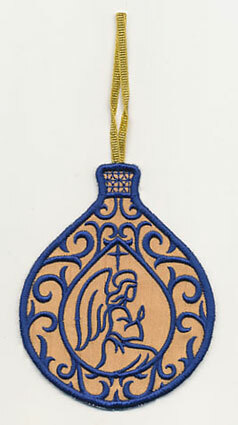 It's a beautiful addition to pillows, stockings, and winter wall hangings. 6.90" x 9.20" and 5.85" x 7.80" and 4.85" x 6.47"
Christmas can be a time to remember past holidays, family, and friends. A wave of nostalgia washes over us! 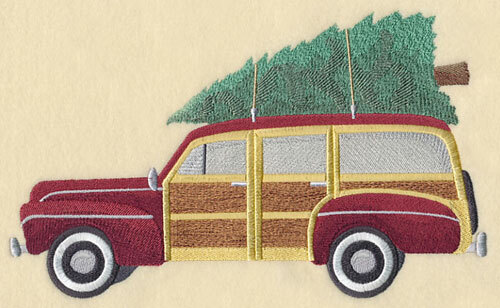 For Linda, one memory is of bringing home the tree in a wood-paneled station wagon. She requested a design that would bring that experience to life, and to have a link from her present hobby to her past memories. A beautiful sentiment, and we were oh so happy to oblige! 9.65" x 5.88" and 7.74" x 4.71" and 6.86" x 4.16"